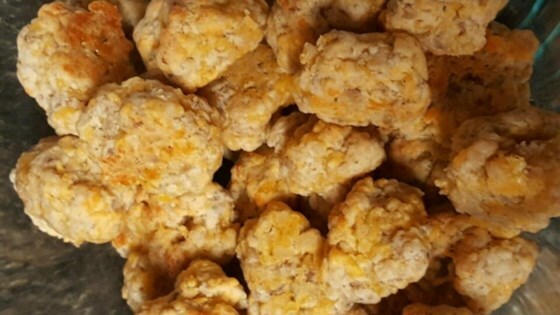 Stir the sausage, Cheddar cheese, and baking mix together in a mixing bowl until evenly combined; roll into 1 inch balls and place onto an ungreased baking sheet. Bake in the preheated oven until the pork is no longer pink in the center and the balls are golden brown, 15 to 20 minutes. WAY too biscuit-y. These are super-dry. You have all the right ingredients, but your proportions are off. Maybe something like 122 sausage balls would be perfect. This Recipe is very easy and very good! No changes necessary. I think it would be just perfect with only two cups of bisquick. The mixture wouldn't mix well so I HAD to add 1/2 cup of milk. Next time I will try 2 cups of bisquick.